Included in the price : appetizers, a bottle of wine and setting the table. Sophie cooked our 7 dinners. She was a delight and her meal were memorable, as was the way she decorated the table. The experience could not have been better! I would highly recommend Mas de Fleurs and Chefs Sophie and Nadege. We had Chef Sophie prepare two casual dinners for us. The food was very good and Chef Sophie and her assistant were very pleasant. One might argue that the cost may be a bit on the higher side but the dinners certainly added to our enjoyment. A short note of thanks once again for your lovely dinner at Mas St Roch last week. We were all so very impressed with the beautiful table you set for our families, and of course the food was outstanding. It was our great pleasure to meet you and Valerie, and we send you both warm regards. The memories of a delightful experience will remain as a highlight of our vacation in Provence. 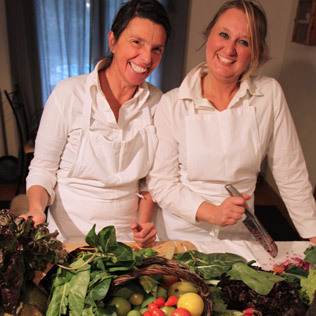 Chef Sophie and Chef Valerie prepared a delicious and beautiful meal for our family of ten. They were pleasant and professional. The chocolate moelleux was magnifique! We highly recommend them! The chef we had (Sophie) was fabulous, great meal, very kind woman. Wow— copious, earthy and such a welcome treat on our first evening. We had the goat cheese tart which was fabulous and the eggplant and pilaf dish for the main dish which was out of this world!! What a perfect way to begin the week and we had great left overs for lunch the next day. This was a super menu for a crowd that included several vegetarians. We had Chefs in 5 of the nights we were there and they were all great, I would recommend them without hesitation as well. Through Only Provence we hired three different chefs to come to the house and cook for us: Chefs Sophie, Gerald and David. All three were excellent. 5 stars for Sophie and Marie. We loved our beautiful meals! They were among the highlights of our trip. We were very pleased with Sophie's cooking and she and Frederic were very pleasant to work with. I would strongly recommend our chef for two nights, Chef Sophie. She was great. Our meal last night was superb! Everything was delicious. We could not believe how many different foods you gave us. The thoughtfulness for my gluten free son was so appreciated. You are a very talented chef.I don't know which was better ... The pear tart or the chocolate cake. I wish I could learn to cook like you. It's fresh, creative, and innovative. Best of luck on the future. We have had spectacular meals here in Provence, and we have had several truly spectacular chefs... but our entire family has voted YOU as the best of the best! Everyone has favorite menus and choices, but my very own favorite is your stew which is not like ant stew I've ever had. It is truly food for the gods. Thank you from all of us for all your creative artistry and your kind attention to all of us. We thought the meal that you cooked was delicious and beautifully presented. We would absolutely love to use your services again the next time we visit Provence. Sophie and Valerie did a great job. I found it challenging ahead of time with the menu planning because, since we were a family with wide-spread ages, and even though I had asked for family friendly meals, some of the suggestions were not compatible with my ideas. However, we sorted it out via emails, not always easy because of the two languages. In the end, the two women proved infinitely flexible, often cooking something extra for the younger children. They created everything from scratch, using all the wonderful local produce, and worked ceaselessly every afternoon to prepare, serve, and clean up after dinner. They wouldn’t even allow us to help clear the table after dinner. In addition, they were most pleasant. We enjoyed their presence in the kitchen and chatting with them about culinary subjects. I would recommend them without hesitation. Chef Sophie was excellent! Loved that lasagna and her desserts. Just wish I had the lasagna recipe!! Sophie and Fredric were fantastic. The meals were delicious and added to the already idyllic atmosphere in Provence. We especially enjoyed the goat cheese and zuccini tart, the provencal stew, and the chicken tajine with apricots and almonts. The children loved the meals Sophie prepared — especially the deserts. Thank you for making our stay fantastic. What an exceptional evening of food. The food you prepared was delicious and perfectly prepared. The table setting was a nice touch. Merci beau coup. C'etait notre plaisur! Your food was terrific and the grandchildren asked whether we could bring you back to America to cook for us. Your culinary skills made the trip all that more enjoyable for us. Our gourmet dinner with Sophie was fabulous and the Luberon valley may well be the promised land. Dear Sophie, we all thought it was one of the best meals ever! Your presentation was exquisite and thought you and Frederick were so friendly and personable. You earned an A+ from us. Merci. My guests really raved about your dinner. Thank you so much. Thank you for all your great cooking it most certainly made the vacation more relaxing !!! Your dinners were one of the real highlights of our wonderful trip to Provence!! I’d be very happy to write a glowing reference for your Guestbook. Please let me know how I can do so. Thank you so much for cooking for us. We travelled from England, South Africa and Australia to Provence for our special family holiday and your Provencal cooking made our holiday even more special. You brought our holiday a true taste of Provence and we loved trying traditional dishes from the area. The Melon Soup and anchoiade were amazing and I wondered if it would be possible to have the recipes?! Thank you also for cooking for the children, they were still talking about the 'Sophie Cooking' after we left and I don't think I have ever seen them ask for third helpings! The home-made pizza (which Harry called the best pizza in the whole entire world) and legendary crepes will not be forgotten!